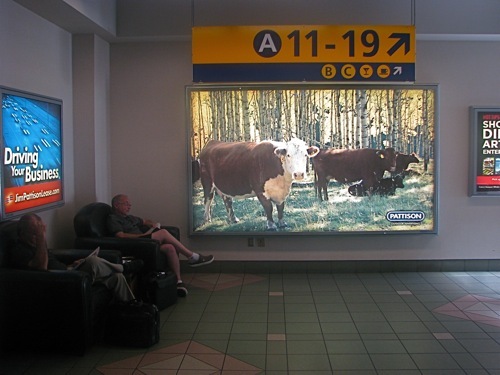 Calgary International Airport. Photo by Sue Frause. I flew to Edmonton yesterday for a nine-day culinary adventure in Alberta with Canadian chef Ned Bell. It promises to be a cool foodie tour, and our group will also be spending time in Canmore, Banff and Calgary. My Air Canada flight from Seattle made a stop in Calgary en route to Edmonton yesterday, and there was no shortage of Stampede Spirit at the airport. From the airport employees with their cowboy/cowgirl hats and boots to the country-western band playing, the 98th edition of the Calgary Stampede is off to a rip-roarin' start. One Edmontonian explained that Calgary is unlike a lot of rodeo towns: the entire city gets into the festivities. I'm so looking forward to attending it next week. It's been on my bucket list for far too long, and I can't wait to see those durn Chuckwagon Races!